Students will be asked to research the Ottoman Empire's Janissary soldiers, then take on the persona of one of these iconic warriors. 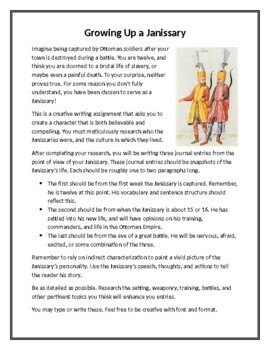 From the first person point-of-view, students will write three journal entries as if they were a Janissary. Through the use of indirect characterization, and the inclusion of rich historical details, students will bring this highly interesting group of men to life. This is an assignment built for Common Core! Bring Language Arts into your History classroom with A Boy's Life: Growing Up a Janissary. 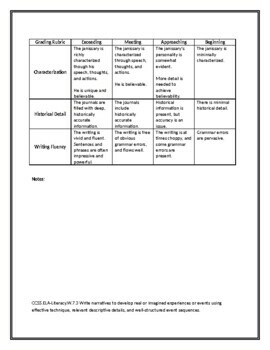 Grading rubric included. Thank you for shopping at Michael Ruegg's Store!